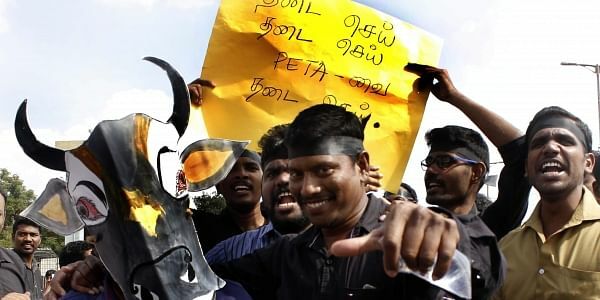 While some abuses bordered on mockery, many young protestors used profane words to insult PETA and other people in power. CHENNAI: There are many reasons why the protests against the ban on jallikattu have garnered so much appreciation, from maintaining cleanliness to following police instructions. However, certain activities of the protestors have shown them in poor light mainly because of the abusive language. The slogans ranged from abuses hurled at ministers from the Central and State governments, mainly Prime Minister Narendra Modi, Chief Minister O Paneerselvam and AIADMK general secretary V N Sasikala. While some abuses bordered on mockery, many young protestors used profane words to insult PETA and other people in power. Unlike most protests which are confined only to men and youngsters, this time around lots of young children and families took part. Though thousands of families extended support and also chanted slogans, a clear discomfort was seen on their faces when they came across profanity-laden placards. “Thousands of us have gathered here to support the cause, but such slogans have led to a little inconvenience especially when we have to repeat them,” said A Shashmitha, a final-year arts students. “I brought my six-year-old daughter here teaching her the traditional values of jallikattu and to support the cause. But I am a little skeptic, moreover worried that she might pick up the swear words that are being used here,” said a concerned mother M Priyadharshini. Meanwhile, another aspect was the crowd was actively repeating slogans which were in clean language and innovative. Slogans like jallikattu jallikattu, dil irunda malukatu (If you have the courage, try and stop us), kombu keta vechukada vambu ( don’t mess with the horns), MRF tyre students na fire boosted the spirit of the crowd and let them share a laugh as well.